As professional wedding photographers, making Washington, DC-based couples look stunning in couples portraits is arguably the most important part of what we do. We have a responsibility to every bride and groom that we photograph to find what makes them beautiful or handsome, draw that out in the way that we pose them and preserve that version of them on film for the world to see. Making that happen is part of the art of wedding photography and the ability to do so consistently is what separates the best wedding photographers from the average ones. It means finding the light that best flatters a pair of newlyweds and plays to their strengths. It means making sure that that light falls on their faces in just the right way, that no stray shadows create any unwanted distracting elements and of course, that the sun or the flash is not blinding the couple! The background should also help to make each of the new spouses look their best. It should add to the feelings conveyed in the resulting image but should never overpower them. The right backdrop can help tell a bride and groom’s love story — for example, if it helps illustrate where their wedding has taken place — but it should always play a supporting role and should never occupy center stage. It must always draw the eye first to the most important thing in the frame: the two people who have just gotten married. Finding the right background for epic couples portraits is not always as easy as you might think and often requires a lot of creativity. Not every wedding venue or hotel where brides and grooms get ready is nestled at the foot of a stunning mountain range or set beneath a cascading waterfall. But the best wedding photographers can make you and your spouse-to-be look like you should be on the cover of a wedding magazine no matter where you get married. That said, it does not hurt when brides and grooms select wedding venues in the Washington, DC, metro area that offer gorgeous backdrops for couples portraits! 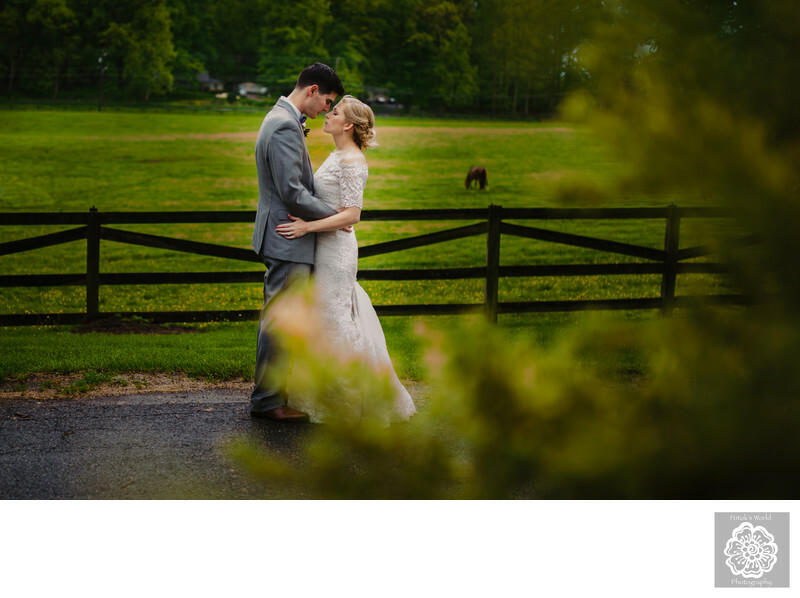 We took this breathtaking photo of a bride and groom who booked Woodlawn Manor in Sandy Spring, Maryland, for their post-ceremony reception. Though the venue unfortunately is no longer available for matrimonial events, it was a beautiful place to take pictures of two people who had just tied the knot. Despite a light drizzle, we took the newlyweds for a little stroll around the grounds of the cultural park surrounding Woodlawn Manor. Everywhere we went, the gentle hills of the park’s working farm reminded us of something out of a fairy tale. The overcast sky softened the ambient light and made the greens of the grass and bushes appear richer and more vibrant. The rain draped everything with a haze that softened sharp edges and gave the entire scene a dreamlike atmosphere. Everything about this setting made it perfect for posing these spouses there. The greens contrasted perfectly with the muted colors of their wedding dress and suit; the softness of the background and the hazy branches in the foreground kept the focus entirely on them; and the solitary horse in the distance added a bit of context to the story this photo tells. Location: Woodlawn Manor, 16501 Norwood Rd, Sandy Spring, MD 20860.